A varied selection of themed and dual / multi function Silver Key Rings. Roulette game key rings featuring a fully working roulette wheel set in a fine quality silver plated case. The sturdy coil wire loop is suitable for holding a much larger number of keys than a standard circular keyring. 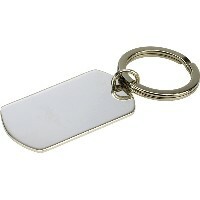 Call the alarm with this elegant and stylish silver plated whistle with a keyrings fitting and engraveable round tag. 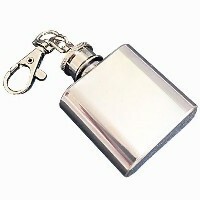 Warm yourself with a wee dram anywhere you go with this handy combination flask and key ring. 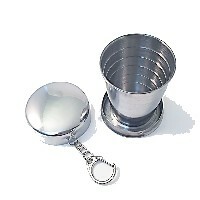 An extremely useful dram sized collapsible pocket cup with Keyring attachment, in chrome / stainless steel. The lid can be engraved. Penknife Silver Plated keyrings. A Beautifully practical and elegantly designed pocket accessory. Curved Heart Silver Plated keyrings. fashioned into locket / photo frame. Round Silver Plated keyrings fashioned into locket / photo frame with mirror. Rectangular Silver Plated keyrings fashioned into locket / double photo frame. 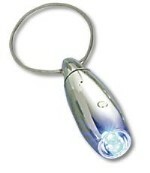 Silver Plated keyrings incorporating spectacle cleaning case. Double ended detachable quick release Nickel Keyrings.